E.M. Forster asks in his novel A Room with a View, “Have you ever noticed that there are people who do things which are most indelicate, and yet at the same time—beautiful?” This profound question—on its own terms, a unique aesthetic thesis—practically sums up the transformative effects of Italian culture on English sensibilities. Robust, reckless, and full-blooded, the stereotypes of Italy stand in stark contrast to the reserved and sensible notions of English gentility. But where Forster refracts Italy through the lens of an Englishman, the composer Gaetano Donizetti gives us a vision of the British Isles in a more continental idiom. Indeed, English history was a popular subject among Nineteenth Century Italians; and Donizetti wrote four operas set in the English Tudor period: the three queens—Anna Bolena, Maria Stuarda, and Roberto Devereux—and the less familiar Il castello di Kenilworth. 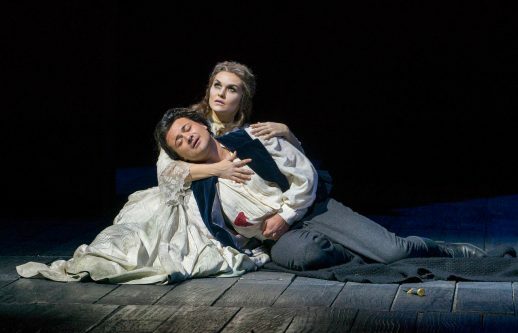 However, it is his Lucia di Lammermoor, a bloody story of a young woman’s mental degeneracy amidst feuding families, which remains Donizetti’s most popular exploration of the landscape and culture of Britain. In the season premiere of the opera at the Met, Vittorio Grigolo summed up this notion of the Italianate embodiment of British sensibility. His performance as Edgardo was quite indelicate, and yet at the same time—beautiful. Indeed, he was, in fact, the driving force of the evening with his full-throttled, muscular singing. And when he wasn’t onstage, one could feel the lifeless weight of his absence. Certainly some might have preferred variations and more subtlety in terms of dynamics and phrasing, but I found his almost manically strident approach to the role energizing. Moreover he displayed admirable vocal security, and his clear, even tenor rang through the house. As Lucia, Olga Peretyatko-Mariotti was less consistent. Her beautiful instrument struggled during the first two acts, as if she were trying to muscle her way through the piece. Her warm soprano moved cleanly through the coloratura, but her high notes sounded dull and forced. It wasn’t until the third act that a sense of vitality found its way into her sound. Perhaps the urgency of the drama helped her; one could hear something fall into place during this difficult scene. I am curious to hear how she fares as the run progresses. Massimo Cavalletti, as Enrico, did not sing well. His evening was plagued with wobbles, barks, and yelps. And these drawbacks didn’t help his dramatic interpretation—it seemed as though his inability to control his voice threw his concentration toward technique, stripping him of spontaneity. In contrast, Vitalij Kowaljow had a better time as Raimondo. His warm, stable bass enlivened an otherwise one-dimensional character. Roberto Abbado, moved the orchestra through the score with precision, keeping the focus on the cast. He was neither obtrusive nor inept, negotiating quite flawlessly between the disparate approaches taken by the performers. In her program notes, Mary Zimmerman made a great deal of the source material, and its real life inspiration. Key to her interpretation of the opera was the specter that haunts Lucia and beckons her to a similarly macabre end. In theory, the ghostly vision is a smart figure to focus on—its symbolism is multivalent, striking the viewer on an intellectual and visceral level. However, one wishes that Zimmerman had gone further with this symbolism, expanding and utilizing it in more complicated ways. Part of Lucia’s fascination lies in its horror, the blood and viscera, and the spectacle of madness and violence. But instead of making use of these exciting elements, Zimmerman simply directed some random woman in white to skulk across the stage every now and again. The effect was disappointing, if not downright comical. Beyond this half-hearted embellishment, there wasn’t much to the production in terms of innovation. Zimmerman updated the setting to the 19th century, with little justification. And there was a deconstructed, wintry texture to the sets. I admire her commitment to the melodramatic genre. But still, Zimmerman’s direction felt, at times, a bit arbitrary. For example, during the sextet in Act II, she busily moved her performers about the stage, arranging them into a formal pose for a photograph. This made no logical sense, and it undercut the music’s inherent drama. And, also, when Raimondo reported the news of Lucia’s murder and madness to the wedding guests, he proclaimed it from a high platform as if he was Eva Perón on the balcony of the Casa Rosada. Overall, the effect felt limp and toothless. And the bland approach to the material placed a great deal of responsibility on the performers; wherein, Grigolo was the only one who seemed up to the task. I hope, in the succeeding performances, his colleagues might rise to meet his provocative challenge.